MCP1651 is a 750 kHz gated oscillator boost controller packaged in an 8 or 10-pin MSOP package. Developed for high-power, portable applica-tions, the gated oscillator controller can deliver 5 watts of power to the load while consuming only 120 µA of quiescent current at no load. MCP1650/51/52/53 can operate over a wide input voltage range (2.0V to 5.5V) to accommodate multiple primary-cell and single-cell Li-Ion battery-powered applications, in addition to 2.8V, 3.3V and 5.0V regulated input voltages. An internal 750 kHz gated oscillator makes the MCP1650/51/52/53 ideal for space-limited designs. High switching frequency minimizes the size of the external inductor and capacitor, saving board space and cost. The internal oscillator operates at two differ-ent duty cycles depending on the level of the input volt-age. By changing duty cycle in this fashion, the peak input current is reduced at high input voltages, reducing output ripple voltage and electrical stress on power train components. When the input voltage is low, the duty cycle changes to a larger value in order to provide full-power capability at a wide input voltage range typical of battery-powered, portable applications. 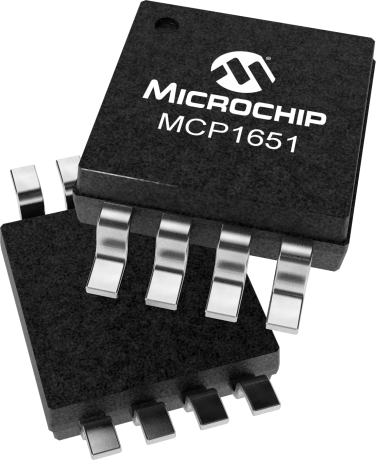 The MCP1650/51/52/53 was designed to drive external switches directly using internal low-resistance MOSFETs. Additional features integrated on the MCP1650/51/52/ 53 family include peak input current limit, adjustable output voltage/current, low battery detection and power-good indication.